Several new models of hearing technology, including your Oticon Opn™, allow the convenience of rechargeable technology, meaning you never have to change a battery again. The benefits are plentiful: your charger can be your devices’ overnight home so you don’t have to worry about losing them, you don’t need to worry about having extra batteries on hand and you will save time and money by not having to purchase disposable batteries. And the best news? You may not have to purchase a brand new device. If you have a non-rechargeable Oticon Opn™ device, the battery door can be switched out to be compatible with rechargeable batteries. 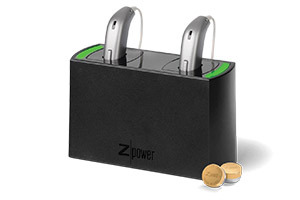 This easy and convenient ZPower technology, Oticon’s upgraded battery door for Opn™, provides a full day’s use with one overnight charge and allows you to hear without the hassle. And if you happen to forget to charge your device one night, you can easily switch your rechargeable batteries out for disposables. Oticon isn’t the only manufacturer offering this new feature. 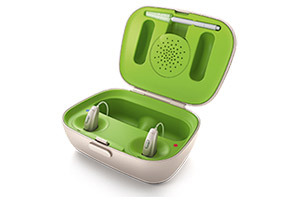 Phonak is releasing the next generation hearing platform this August. The Belong platform is built with superior technology, specifically designed to simplify consumes’ lives. Within this platform is the new Audéo B-R, a receiver-in-canal style hearing aid with lithium-ion rechargeable battery. The lithium-ion rechargeable battery can provide an unprecedented 24 hours of hearing from a single 3-hour charge. The hearing aid contains a 30-minute fast-charging option, which gives uses six hours of immediate use. This battery offers 400 percent more power than conventional rechargeable batteries. This makes the Audéo B-R the quickest charging, longest lasting rechargeable hearing aid ever produced.